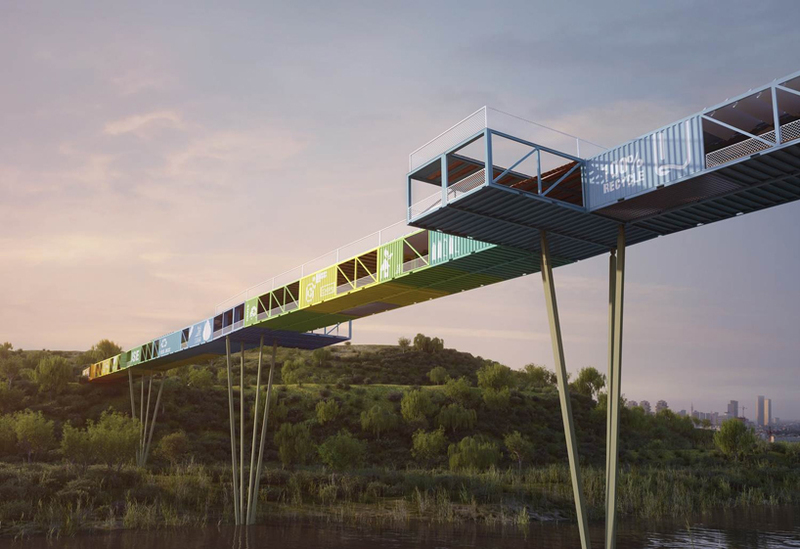 The ECOntainer bridge uses containers as the main structural members, with additional steel trusses for support. It allows individual containers to be constructed before being put into place, as well as individual replacements of each segments. It also contains a observation deck, a set of cantilevering observation areas that extends out of the opposing sides, and its own source of power via solar panels on the tops of the containers (for advertisements and other important information). Amusingly, this bridge, designed by Israeli practice yoav messer architects for ariel sharon park (in Israel of course), also allows small amounts of vehicle traffic through as well.